The only thing better than the smile after catching your first fish is the roominess of the R160. Sixteen feet never looked or felt so good. Upfront, a sizeable casting platform is detailed with Diamond Lustre non-skid for sure footing while fishing. 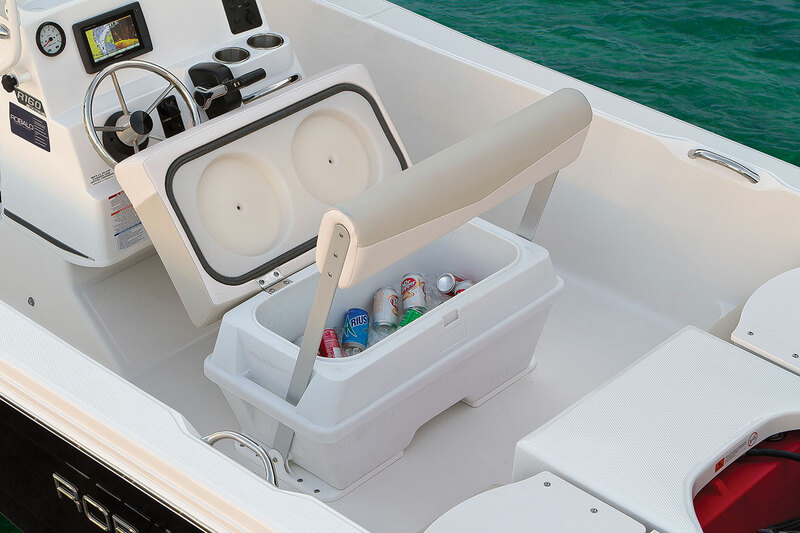 A sizeable insulated locker is perfect for stowing fish or icing cold drinks. Stainless steel insert rails can be upgraded with an optional high profile bow rail. 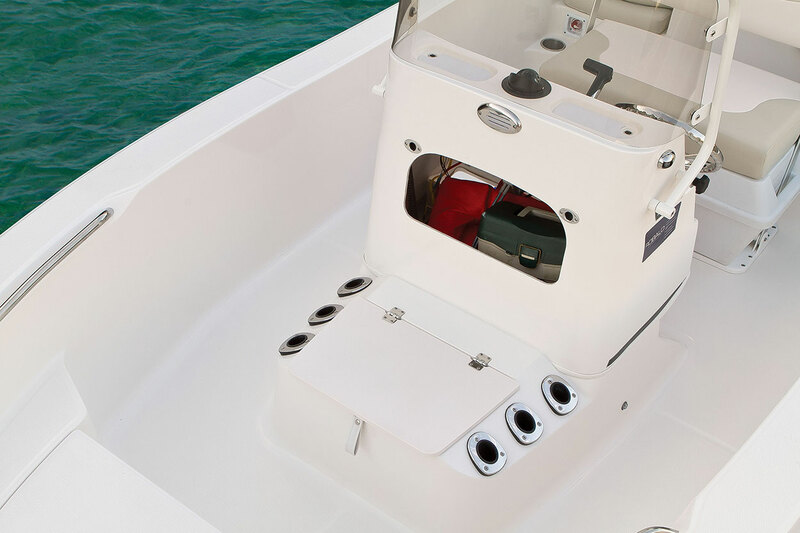 Taking full advantage of every inch of space, the R160 has a multipurpose fiberglass console compartment. Robalo worked its engineering magic perfectly inside the R160. Aft the adult-sized jump seats that fold into a casting platform. 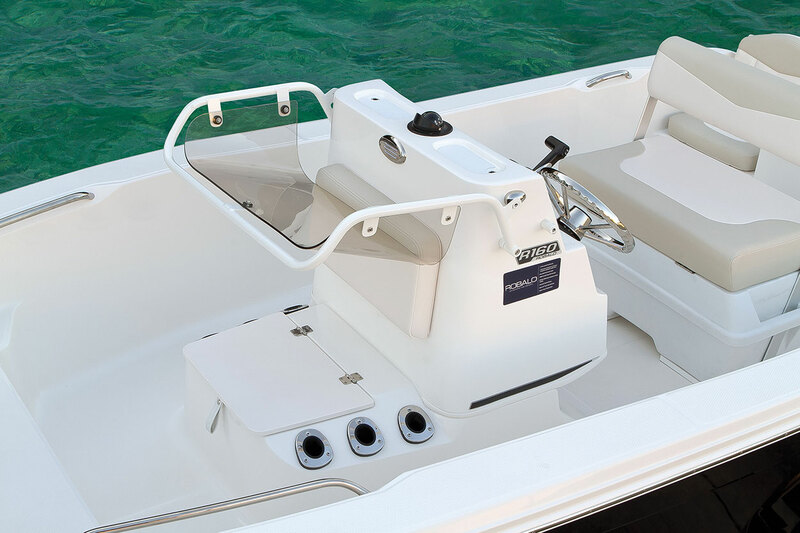 A boater's-best-friend 5 gallon bucket stows in its own compartment below the port seat with storage and rigging access to starboard. 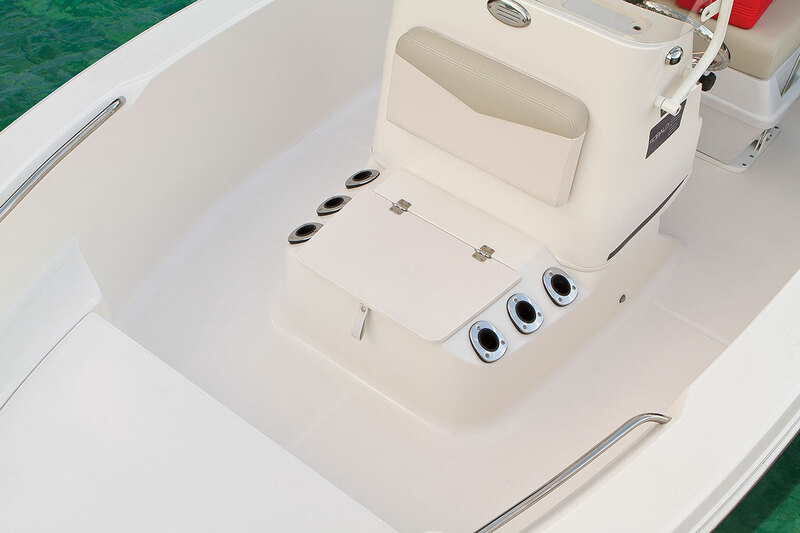 A clever transom boarding step makes it easy to get back onboard after spending time in the water. The R160 is also equipped with an easy-access fuel tank. 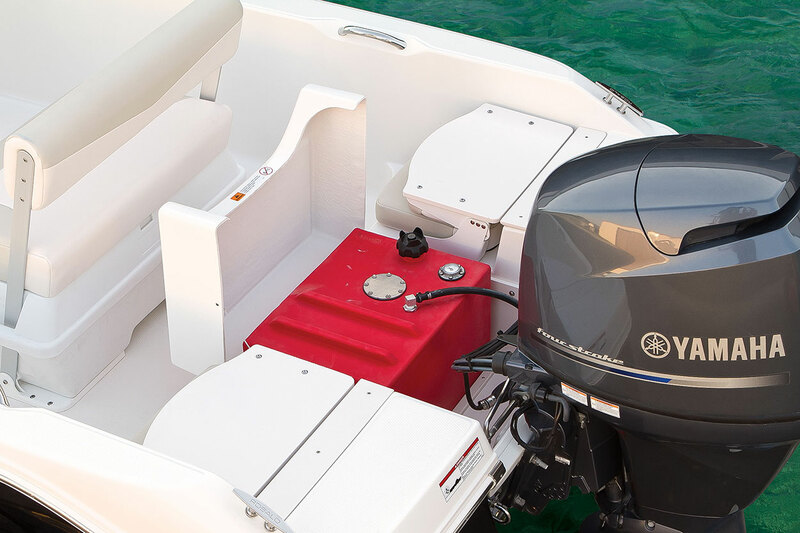 Neatly tucked below a hinged lid aft, not an awkward slide-out compartment, the fuel tank is easy to reach whether you're at a marina dock or filling up on the trailer. Robalo's sensational Extended V-Plane running surface stretches full length, giving the R160 a competitive performance edge over rivals. Look closely. 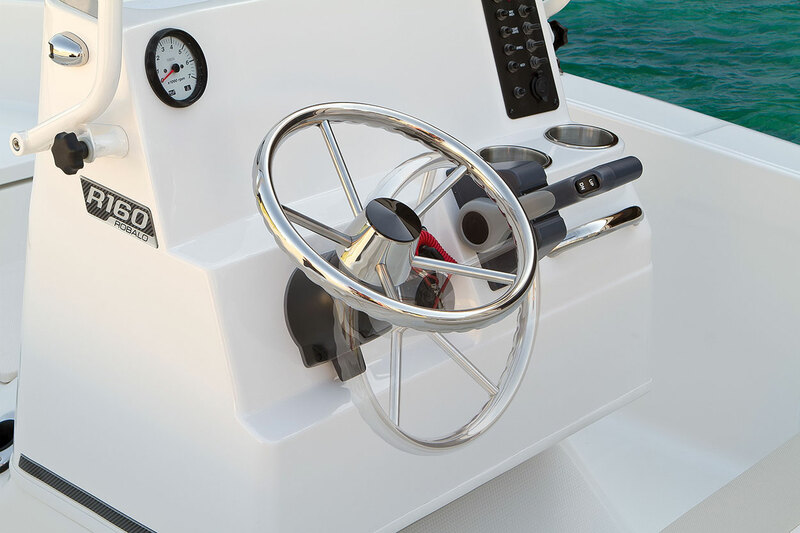 The bottom extends beyond the engine bracket, creating built-in trim tabs and a longer running surface. The result: the R160 rockets on plane, tracks true, is exceptionally efficient in the all important midrange and tames moderate seas far better than you'd expect in a 16-footer. The goal was to chart new waters at 16-feet. Mission more than accomplished. Robalo's design team successfully combined a shallow water draft with a dry, soft and predictable ride in big water. 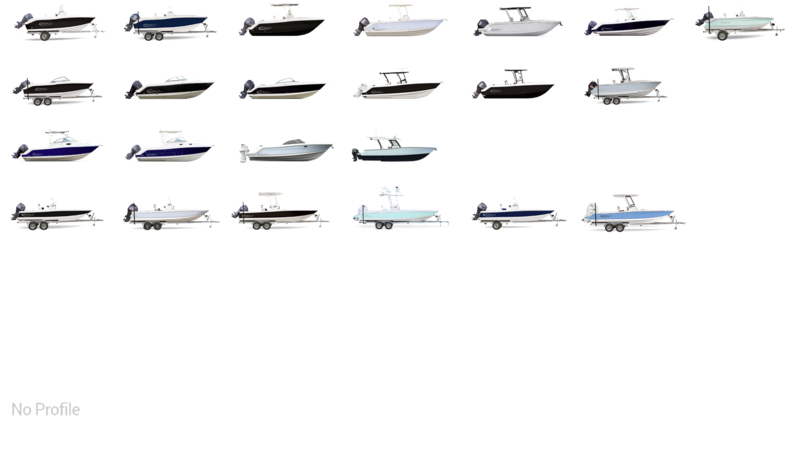 At first glance, it's easy to see the R160's bloodlines are classic Robalo. Styling cues from the R180 and 200 ensure an award winning look. Ultra wide gunwales make access easy. 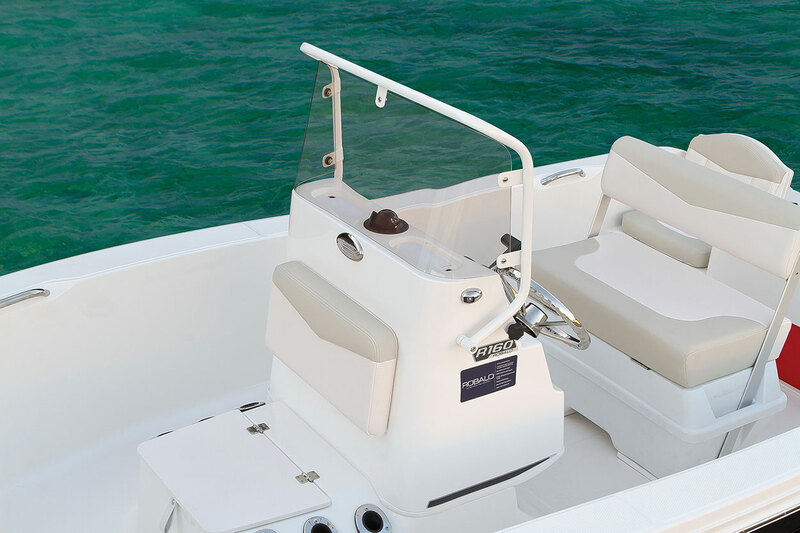 For your boating enjoyment, Robalo took care of everything. The R160 package comes complete with the boat, motor and a trailer. Sized to fit in most garages, all the good stuff you'd expect from a Robalo trailer is standard...heavy-duty aluminum construction, 14" tires and rims, high quality winch and LED submersible lighting. Road-ready with your current lightweight truck or sport utility vehicle, the R160 allows you to forego the added cost of a special tow machine. Trailer options include a spare tire kit and an aluminum trailer upgrade with brakes.